Who wouldn’t want more ideas for cooking simple meals at home? This is the goal of the latest book from Diana Henry, Simple: Effortless Food, Big Flavors , and I received a review copy. I agree completely with her statement that “You don’t need many skills to feed yourself, your friends, and family well… What we mostly lack are ideas.” This book is full of great ones for quick, weeknight meals. There are a few dishes that take a little longer to prepare, but they’re not difficult. She repeatedly offers suggestions for substitutions or things that can be omitted to further simplify or personalize the recipes without sacrificing flavor. From Eggs to Salads to Pulses to Chicken, Vegetables, and more, the chapters cover a broad range of meals and parts of meals. As often happens as I read cookbooks, I ended up with sticky flags marking several pages. I marked the recipe for Linguine All’Amalfitana because I’d never before seen this particular pasta sauce with garlic, anchovies, and walnuts. The Smoky Couscous sounds fabulous with smoked paprika, lemon, green olives, almonds, and roasted red peppers. Then, the sauce for the Pork Chops with Mustard and Capers is so simple to make but sounds so delicious, I want to try it on roasted chicken. There are some tempting, easy desserts as well with a whole chapter of Fruit Desserts followed by Other Sweet Things. The Bitter Flourless Chocolate Cake with Coffee Cream got my attention, and now I’m going to want espresso in my whipped cream all the time. Next, I turned to the Salads chapter where I couldn’t decide where to start. My indecision was due to two different salads involving roasted carrots. In the Harissa Roast Carrots, White Beans, and Dill recipe, the carrots are roasted with harissa, and lemon slices are roasted with them and added to the salad. I loved the idea of the roasted lemon slices. 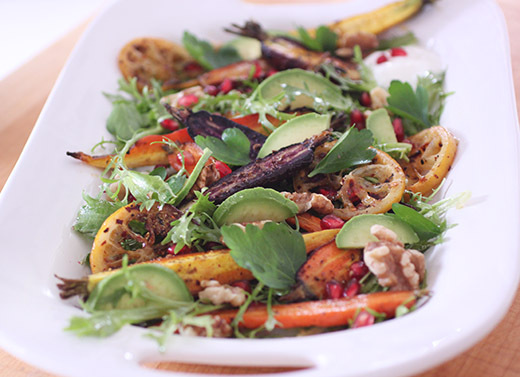 In the recipe for Cumin-Coriander Roast Carrots with Pomegranates and Avocado, the carrots are roasted with a drizzle of olive oil, cumin seeds, crushed coriander seeds, and crushed red chile flakes. I ended up going with the second option and adding lemon slices to the pan while the carrots roasted. This salad was a bright mix of pomegranate seeds, avocado slices, a tangy dressing with pomegranate molasses, and crunchy walnuts. I used frisee that I found at Boggy Creek Farm rather than watercress for the salad greens. And, I had some pretty and colorful carrots from my CSA. My carrots were different sizes. So, some of them were halved and other quartered lengthwise before roasting. Also, I don't have cilantro growing in my herb garden right now, but I do have parsley and used that instead. As promised, there was nothing difficult about making this. It was all about the ideas, and I was delighted to combine some from two different recipes. In between the pages for the two salads with carrots, there’s one for Burrata with Citrus, Fennel, and Olives that kept making me stop and think about it as well. With so much inspiration here, I won’t run out of ideas for what to have for dinner for a long time. 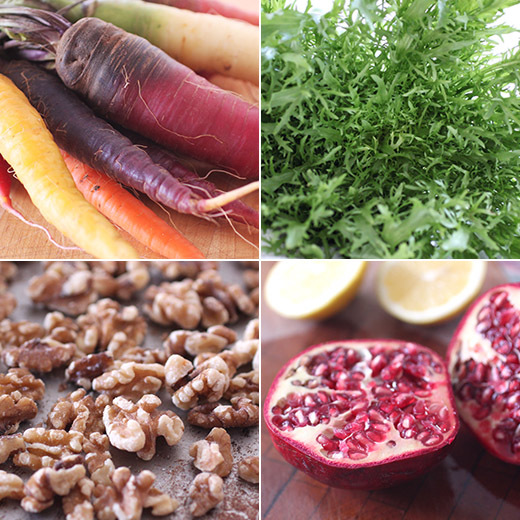 Recipe reprinted with publisher’s permission from Simple: Effortless Food, Big Flavors . Preheat oven to 400 degrees F. Trim the carrots at the top but leave a little of the green tuft on. If you can’t find slim carrots, halve or quarter large ones. Don’t peel the; just wash them well. Put in a roasting pan in which they can lie in a single layer. Add the olive oil, spices, and seasoning. Turn the carrots over in this to ensure they are all well coated. Roast in the oven for about 30 minutes; they will become tender and shrink slightly. Be careful not to overcook them. To make the dressing, just beat everything together with a fork. Halve and pit the avocados, cut into slices, then carefully peel each slice. Put everything except the yogurt, garlic, and pomegranates into a broad shallow bowl (or onto a platter) and gently toss in three-quarters of the dressing. Mix the yogurt with the garlic and dot spoonfuls of this among the vegetables, then scatter with the pomegranate seeds. Spoon on the rest of the dressing and serve. What a gorgeous side dish! 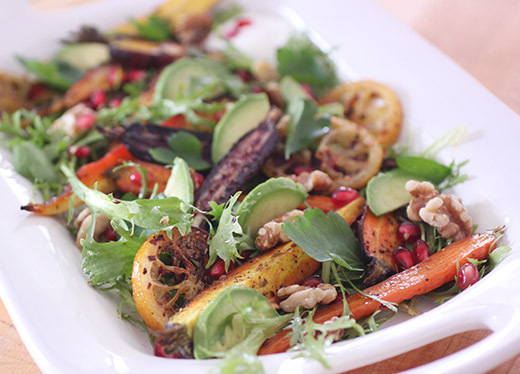 Roasted carrots are always great, and these flavours look amazing. This is such a fabulous dish! Very original and mouthwatering. So fresh and packed full of flavours! Definitely my kind of food. HI Lisa, I have heard so many wonderful things about Diane Henry, must get one of her cookbooks. Love this simple but stunning dish, looks wonderful. This dish looks both stunning and delicious! Oh Lisa, the carrots look fabulous, so much flavors and colors...what a nice way to glorify carrots...awesome! I've done several roast carrot dishes and can never get enough. I love the savory sweetness of them! This sounds fabulous! Can't wait to try it!